He takes his seat, knowing he can always wait in line again like every other American and refill his cup for a small price that is much like a tax increase. He steals the seat of a mother who had just gotten up to throw away something and waits for his Trenta Caramel Frappuccino. After all, calories are made up and part of the liberal agenda. Last but never least (because she was actually the first to be in the White House of all the candidates running, in case you didn’t know), Hillary strolls in. Joyfully sobbing crowds follow her, carrying hardback versions of “Hard Choices” and holding out their phones for a Snapchat selfie. She smiles at every person in the Starbucks and continues smiling at the barista. Since she's been to Washington before, I mean Starbucks before, she knows how Starbucks works. She stares at the menu. “Do you have coffee with ice here?” she asks. “We have iced coffee,” the barista replies. “I will have a coffee with ice and milk, in that case.” She then flashes her trademark smile. She continues standing at the cash register smiling. “You can wait for your drink over there,” the barista says. Bernie, meanwhile, sips his pike roast while a bird sits on his shoulder. He adds to Trump’s outburst: “The poor should be able to afford soy milk! If Wall Street and their recklessness…” He trails off. Bernie has stood up by now, but the camera didn’t catch that because they were focused on Hillary with the adopted baby. A crowd has gathered around him. They all sport backpacks with Feel The Bern buttons beside recycling and “Coexist” stickers and have skipped their freshman sociology class (today’s lecture was supposed to be on “pragmatic solutions versus fantasies”). 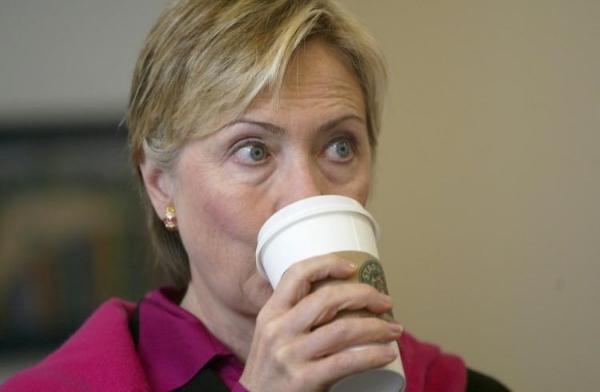 Hillary tries telling the crowd she loves hot black coffee, too, as her aide hands her her iced coffee with milk. In the meantime, Trump is building a wall of sugar packets between himself and another customer. He glances at his watch and makes one last plea that Starbucks stop promoting recycling, leaving the wall standing. He exits the building after asking his Secret Service to teargas everyone outside. Someone tweets back a screenshot of a 2011 tweet showing the Donald beaming with Dunkin’ Donuts in hand. “A Frappuccino,” her aide corrects. Okay, so maybe we should drink less caffeine. *Justin Porter graduated from James Madison University in 2015. He has written for ATOB several times and was most recently featured in Cazey Williams' post, "The Illegal Roommate." You can tweet him or like his photos. If you are interested in guest blogging for ATOB, email us at AsToldOverBrunch@gmail.com.